Our plum finish is a deep plum with highlights of black giving depth and texture to the color. Optional engraving on the wind sail with up to 50 characters of your thoughts, feelings, names, and dates. Personalize your chime! We can engrave your Wind Sail for a personalized touch. FIFTY (50) CHARACTERS MAXIMUM, Including Spaces & Punctuation. Corinthian Bells® windchimes rise above the rest because they combine a rich, long-lasting resonance, hand tuned harmonies, and a contemporary design. 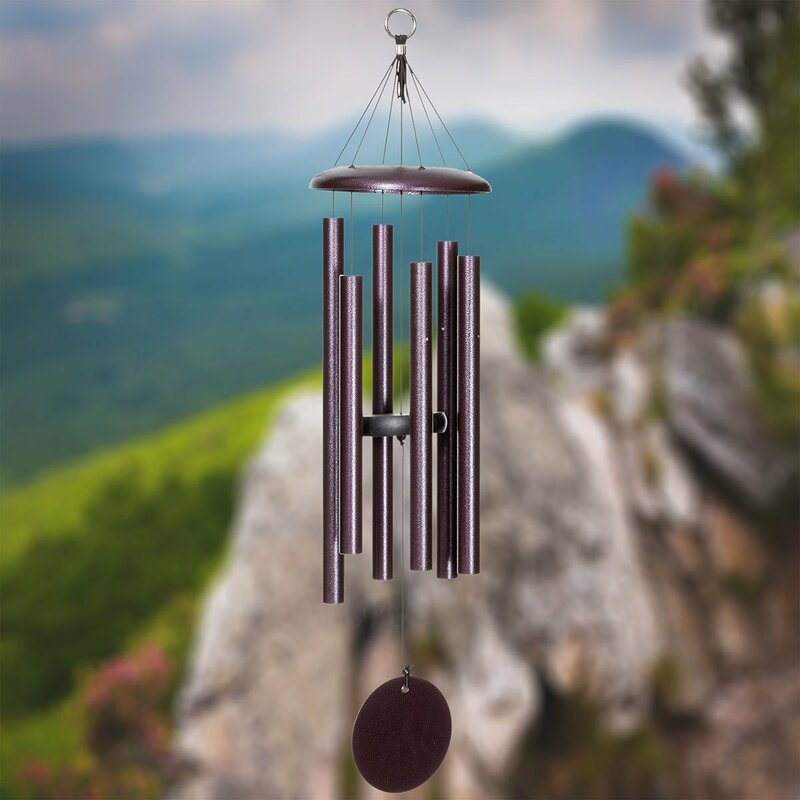 Each handcrafted chime is available in a variety of designer colors. They´re constructed with durable, weather-resistant materials that make them a valuable addition to your home long after you open the box. Corinthian Bells® wind chimes achieve their superb tone and long lasting resonance by starting with the best materials, and giving attention to details in design and assembly. These chimes are made of a unique aluminum alloy, and the strikers are made using a custom polymer formulated to withstand exposure to the outdoors. The central suspension system design allows the tube resonate freely, avoiding the sound-dampening tendency of traditional chimes assembled by running a string through each side of the tube. While any pipe will make noise when hit, the art of chime-making involves finding the pure tones within the geometry and material properties of each size tube. During the development process, the clearest notes from each size tube are choosen, & which scale to assign the model to ensure that the sound quality meets the high standards of a Corinthian Bells® windchime. Each tube is precision-cut and hand-tuned so that it produces a note that is true to its scale. When combined together, the clearest notes produce the purest harmony. Corinthian Bells® wind chimes come in six designer colors, certain to accent your home decor. The domed top provides an attractive contour and gives substance to the string assembly. The dome, tubes, and wind sail feature matching finishes. Corinthian Bells® chimes are built to last. The finest materials are selected to assemble these windchimes with determined consistency to provide you with quality you can count on. The windchime domes, and wind sails are an aluminum alloy which will not rust. The powder coated finishes are selected for their strength and durability against fluctuations in temperature and humidity. The braided nylon cord used on is strength-tested and resistant to ultraviolet light. Each Corinthian Bells® wind chime comes with a five-year warranty against defects in materials or craftsmanship. From start to finish, our Corinthian Bells® windchimes are Proudly Made in the USA. Each chime is designed and built using materials sourced from American mills and material providers. From the raw materials to the finished windchime, each step the manufacturing is carried out using American materials and labor. * 5-year limited warranty against defects in craftsmanship or materials. (hanging ring to the end of the wind sail), not the tube length.